Life is full of meaningful moments that can be expected or totally unanticipated. Recognizing these milestone moments helps bring an awareness of God's presence into the home and highlights the rituals of daily life experiences. 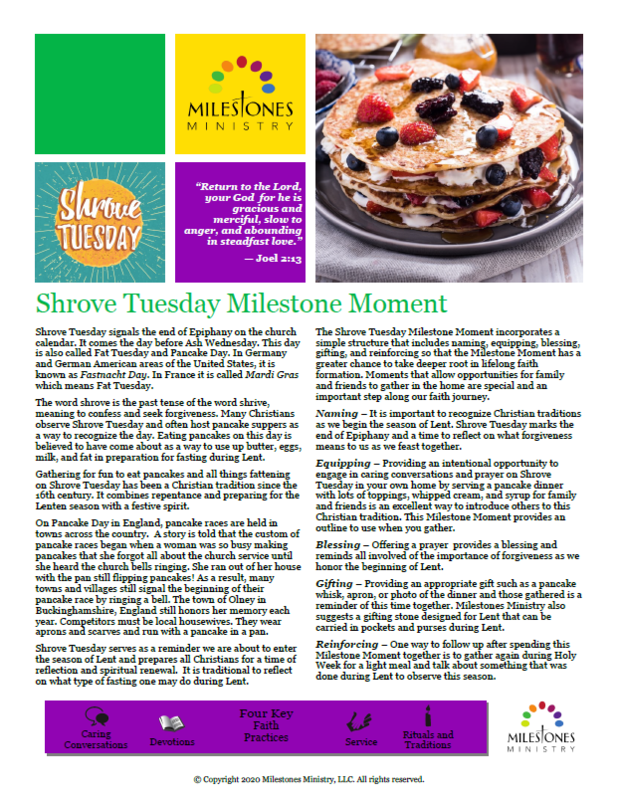 This Shrove Tuesday Milestone Moment supports the important experience of marking the end of Epiphany and the time to reflect on what forgiveness means to us as we feast together prior to the beginning of Lent. The word shrove is the past tense of shrive, meaning to confess and seek forgiveness. Gathering for fun to eat pancakes and all things fattening on Shrove Tuesday has been a Christian tradition since the 16th century. It combines repentance and preparing for the Lenten season with a festive spirit.